This is a Welding Assisted Studio for members and guests to work on personal projects. 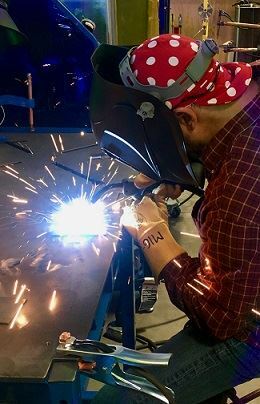 This class is for those that have complete MIG 1, 2, and 3 OR previous welding OR plasma cutting experience. An additional materials fee of $15 for up to 5 pounds of steel (on hand), filler wire, gas, and consumables will be added to the class price. Teacher/Monitor: Henry Sharpe Henry is an amateur welder and active the the Metal Fabrication Group at BARN. He is the studio lead for welding.